The gap between the football programs at Virginia and Virginia Tech was made obvious again on Saturday, on and off the field. The Hokies won their seventh straight in the series and 11th in the last 12 in typical dominating fashion, 37-7. “They are the measuring stick right now. You are humbled by the fact that that’s where you’ve gotta go. That’s what I aspire to be, our program to be. A team that win games and consistently competes for championships,” said UVa. coach Mike London, whose team finished its first season with him at the helm with a 4-8 record overall and a 1-7 mark in Atlantic Coast Conference play. Which is pretty much what those in the know had expected from the Cavs heading into the 2010 season, given how little London had to work with. In the other locker room, Tech coach Frank Beamer was singing the praises of his bunch, which reached the 10-win mark for the seventh consecutive season. “We were at a point where we were just trying to win the next game. But it makes a statement about these players and this coaching staff. We had good players. We just had two tough losses. Some teams would have taken it to the house. But this team didn’t. They supported each other. We have a tight-knit group here. So far, it’s been quite a year. The two losses make you appreciate these 10 wins even more. I’m proud of these guys,” said Beamer, whose regular-season ACC sweep had been projected by the cognoscenti, but came after a pair of losses to open the 2010 season that included an improbable 21-16 loss to James Madison at home on Sept. 11. The talent gap on the field is a big part of the reason that Virginia Tech has dominated the series with Virginia in recent years, to the point that it can hardly be called a rivalry at this point, any more than the relationship between a hammer and a nail can be referred to as a rivalry. Just as important: how the teams respond to adversity. “With our offense, when its third down, there is no doubt that we should get the first down. Our players are big enough, tough enough and physical enough. It’s disappointing that we didn’t do it,” Virginia offensive coordinator Bill Lazor said of the back-to-back plays inside the Virginia Tech 15 late in the first half where UVa. failed to convert a third-and-one and fourth-and-one and turned the ball over to Tech on downs. 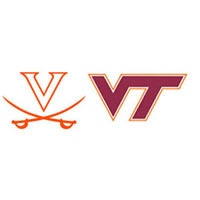 The Hokies, up 14-0 at the time, drove down to the Virginia 23 and scored just before halftime with a Chris Hazley 40-yard field goal that made it 17-0 at the break. Virginia Tech (10-2, 8-0 ACC) needed just 50 yards of offense to score its two first-half touchdowns – converting a Marc Verica interception into a five-yard TD run by Ryan Williams and then driving 45 yards in three plays following a failed fake-punt to score on a Tyrod Taylor-to-David Wilson 20-yard pass. Tech was more its usual dominant self in the second half, extending the lead to 37-0 on scoring runs by Williams, Darren Evans and Wilson before Virginia got its only score of the day with 2:59 to go in the fourth on an 11-yard TD pass from third-string quarterback Ross Metheny to senior tailback Keith Payne. The Hokies still have plenty of business to attend to – an ACC Championship Game appearance next Saturday, then a bowl game. For Virginia, it’s already 2011. “I’ll be working tirelessly to attract the type of young man that can help us win on the field,” London said. The injection of a dose of we think we can, we think we can, we think we can into the chemistry in Bryant Hall couldn’t hurt things to that end. Story by Chris Graham. Chris can be reached at freepress2@ntelos.net.